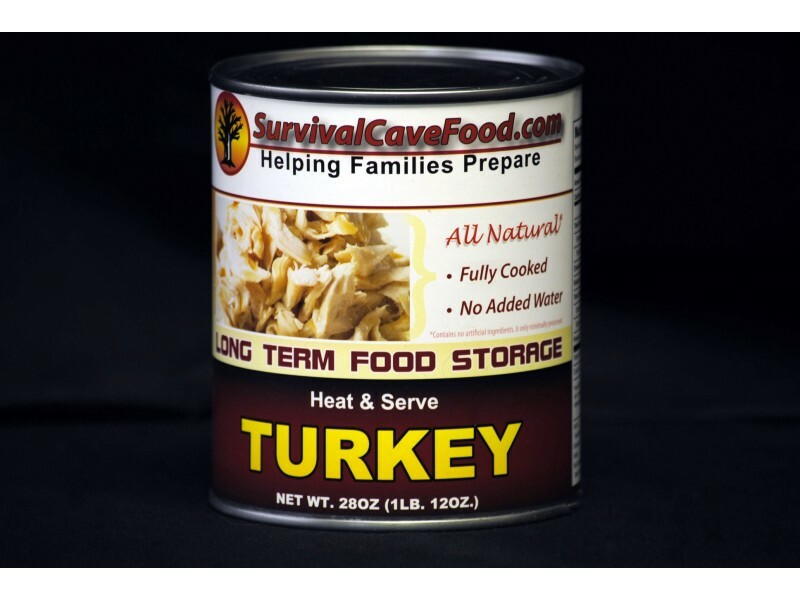 Buy Survival Cave - Canned Turkey - 28 oz , from SurvivalCaveFood.com for $15.99 only in My e-commerce. Does your canned food storage program consist of enough long term food? 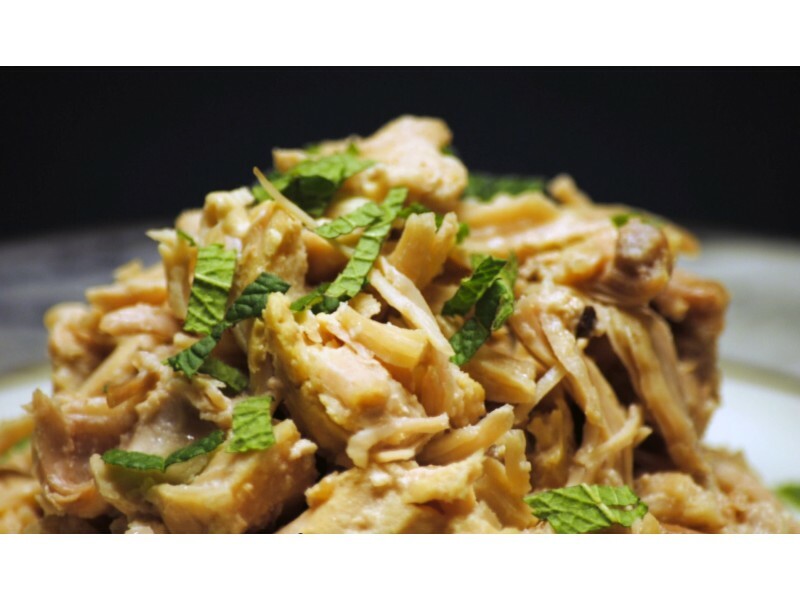 Are you currently missing the necessary proteins like our canned turkey could provide? This canned turkey is the food that you will need in times of emergencies. Our meats are processed in a manner that makes them excellent for any canned food storage program. This is the finest quality meats available and it's hand packed within manageable 28 oz. cans. Just how long will this canned meat last? Each of our canned meats are prepared in a very different manner than most canned meats available in the market. They are slow pressure cooked at a low 240 degrees and have NO EXPIRATION date. A reasonable shelf life is approximately 12 -15 years however, many individuals believe it may last 30 - 35 years or even longer. You will get a one can with 28 ounces in the can, no water or broth added, just the all-natural juices of the meat. This delicious line of meats is prepared to provide you with the maximum quantity for your personal food dollars. They are simply hand packed and “non mechanically separated meats” and we also NEVER ADD WATER or broth. This makes certain that everything you purchase is meat. Once you open up these cans they are ready to eat and tasty in virtually any recipe you would use fresh cooked meat. Our canned storage meats are all natural and DO NOT include any MSG, additives, fillers or chemical substances. They are lower salt, low in unwanted fat and healthy for one’s family. 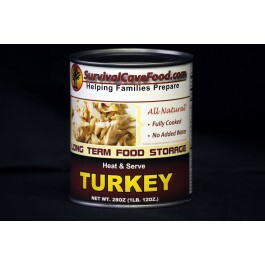 USDA inspected Survival Cave Food canned meats are only made with 100% USDA inspected meats. Many other canned meats are foreign meats or state they are packaged in the USA but the meat in reality comes from other countries around the world and are simply packaged in the USA. We simply use 100% USA meats! Survival Cave Food long-term canned meats are probably the best purchases you can make. All of these quality meats are affordable but will last for many years and enable you to make the right investment that is possible, FOOD. There has been price increases in food products topping 35 - 40% or higher. So when you desire to invest in something which your family is sure to enjoy and also reap the benefits of, Survival Cave Food’s long-term canned meats are exactly what you ought to have and are the perfect choice for you and your loved ones. You will get a one can with 28 ounces in the can, no water or broth added, just the all-natural juices of the meat. Just how long will this canned meat last? Each of our canned meats are prepared in a very different manner than most canned meats available in the market. They are slow pressure cooked at a low 240 degrees and have NO EXPIRATION date. A reasonable shelf life is approximately 12 -15 years however, many individuals believe it may last 30 - 35 years or even longer.